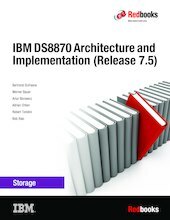 This IBM® Redbooks® publication describes the concepts, architecture, and implementation of the IBM DS8870. The WhitepaperRedpaperbook provides reference information to assist readers who need to plan for, install, and configure the DS8870. The IBM DS8870 is the most advanced model in the IBM DS8000® series and is equipped with IBM POWER7+™ based controllers. Various configuration options are available that scale from dual 2-core systems up to dual 16-core systems with up to 1 TB of cache. The DS8870 features an integrated High-Performance Flash Enclosure (HPFE) with flash cards that can deliver up to 250,000 IOPS and up to 3.4 GBps bandwidth. A High-Performance All-Flash configuration is also available. The DS8870 now features 16 Gbps host adapters. Connectivity options, with up to 128 Fibre Channel/IBM FICON® ports for host connections, make the DS8870 suitable for multiple server environments in open systems and IBM z™ Systems environments. DS8870 Release 7.5 brings new and enhanced IBM z Systems™ synergy features. These features are covered in detail in IBM DS8870 and IBM z Systems Synergy, REDP-5186. The DS8870 supports advanced disaster recovery solutions, business continuity solutions, and thin provisioning. All disk drives in the DS8870 storage system have the Full Disk Encryption (FDE) feature. The DS8870 also can be integrated in a Lightweight Directory Access Protocol (LDAP) infrastructure. The DS8870 can automatically optimize the use of each storage tier, particularly flash drives and flash cards, through the IBM Easy Tier® feature, which is available at no extra charge. This edition applies the IBM DS8870 Release 7.5.